Is there a fruit as filled with romance, history, myths and fairies as the venerable, soft blushed grape? An orb as wide ranging as a chicken, it may be responsible for more discussions in more diverse settings than any other edible fare. In warm-blessed sections of the earth it can understandably be the "nectar of the gods" fresh off the vine. Whereas the fruit elsewhere may make one seriously question the gods good taste. But no matter, some type of grape can be grown in most areas of the cultivated world. 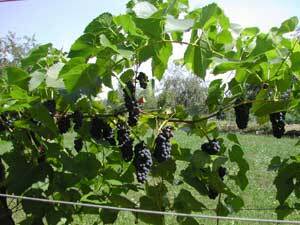 There are native grapes in almost every part of the temperate zone, and in the sub-tropics as well. Grapes can be equally as challenging and fun no matter where they set root. Of course, a grape here is not the same grape there. Types and varieties abound -- table grapes, wine grapes, grapes for juice and grapes for jam, those with seeds, those without and those that take to raisining; wild, native, old world, new world, hybrid. Endless shades of blue, white, red. There are rampant growers and reluctant producers, varieties that will call it quits at the mere mention of freezing temperatures while others consider cold snow country the best there is. Then there are the trellising choices. Probably hundreds. Not for the grape is the simple bean pole, except for the first year or two. And the pruning. You mean actually get in there and prune that jungle?! I’d never get out alive! Aaughhhhhh!!!!! Thus says one who left the vines to their own devices for too many years. So the grape isn’t for the faint hearted, nor for the overly busy or the impatient. Maybe it won’t be the first fruit planted on the homestead, or the second or third. But sooner or later things will calm down a bit and you’ll start wondering about having your own vineyard, no matter how small. You’ll find yourself perusing the grape sections of the catalogues and salvaging wine bottles. Grapes take a certain commitment, a connectedness. The best growers have a respect and sensitivity to the vine that would be a good role model for world peace. Though the grape doesn’t need us -- it would no doubt be happy to be left to grow wild in the trees -- we seem to need it, and when we agree to collaborate, great things can happen. Once you sort out the details, it isn’t even that hard. There are many books written about growing grapes, and I recommend you read all you can. Visit neighboring grape growers, search the internet, keep an eye open for nearby classes or workshops, read the catalogues. Most of all, keep an open mind and in touch with your own common sense, and climate. There will be many contradictory recommendations, often from the same source, and the differing options can be confusing. The truth is not the same for everyone, and what is best for one is not for another. But over the years, I’ve found certain patterns emerging. After a time, even the pruning starts to make sense. I’ve had a good time with grapes in this colder part of the country. I won’t suggest you follow my exact footsteps, because I came at grape growing a bit sideways. But it’s been a good relationship, and well worthwhile. 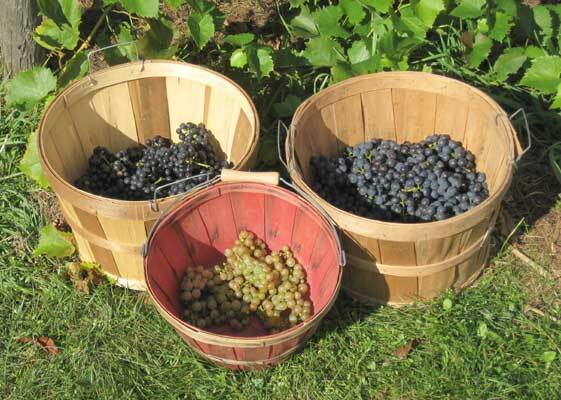 GETTING STARTED WITH GRAPES is relatively easy due to the vine’s enthusiasm for growing. If you are quite tired of the admonition that you put this plant or that in "your best and most fertile soil" -- when the total amount of your thus designated ground could be traversed by a large beetle in a matter of minutes -- you’ll love the grape. It is one of the few crops that prefers less fertile land. Other recommendations vary, but every source I’ve seen talks about the importance of good drainage, particularly soil but air, too. Grapes don’t like sogg, so if you have wetlands leave that area for the wildlife [who certainly need it more than we do] and find drier ground for your grapes. Think well drained. The ideal soil is gravelly, stony, coarse, heat retaining, with enough organic matter, but not too much. But grapes can and do grow in a wide variety of soils, which is good. Most of us have to make do with what we have. Our soil here is mostly sandy loam or loamy sand. It suits the well-drained and not overly fertile designation just fine. The grape has other preferences, of course. And a major one is for sunshine and heat. Not something we have a lot of. But even if the U.P. doesn’t remotely resemble Italy or France or California, we grow grapes. Across the upper Midwest there are a respectable number of vineyards, producing wonderful and interesting wines. The grape is, thankfully, amazingly adaptable. Life is never black and white. I’d like to be able to report that I followed all the rules and thus arrived with a wonderful harvest of grapes via a nice neat orderly line. But twasn’t so. Straight lines don’t seem to suit us. I suppose the fact that our new garden fence ended up with ten sides, and our house has six, says something about how we approach life, and our homestead. My first grape planting (of one vine) was the result of a pretty colored photo in a glossy catalogue and a naive belief in the descriptive hype. Oh well, I’ve made worse mistakes. Hardy is relative. What is hardy in the lake section of New York is not necessarily hardy in the colder areas of the Upper Peninsula of Michigan. I knew we were on the edge though, and planted the little Canadice vine on the east side of our house in a corner by the front door, which I figured was the warmest spot we had. With little air circulation and only part day sun, it didn’t thrive but it did grow. It made it through several winters to produce an impressive crop of one little bunch of grapes. How excitedly I watched those tiny globes grow and ripen. Every time I went out the door I cheered them on. It was late, but they were beginning to color. One day, after a short sojourn to the garden, I came back to the stark sight of stems sans globes. In disbelief I demanded to know what had happened to my grapes! An excited chittering nearby gave me my answer. Lesson number one -- no matter what you think, they aren’t yours. You may get them first, but that has little to do with rights of ownership. The vine gave up the following winter. It was years before I considered grapes again. But by then I had done a lot more reading and studying. This time I purchased cuttings from viticulturist Lon J. Rombough of Oregon, choosing the recommended hardy varieties Valiant and Edelweiss. With the accompanying clear directions I had no trouble rooting and planting the cuttings, novice though I was. We had a well prepared bed for the grapes along the east side of our garden, an open site with both sun and air. 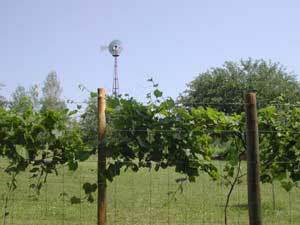 The following year we installed a conventional post and two wire trellis, anticipating the someday heavy vines. The vines grew well, then died back during the winter; the next year they grew, then died back; and again the following year. It seemed we were not only on the edge of their acceptable territory, we were over. And by many knowledgable accounts, these were some of the hardiest grapes available. Sadly we removed the trellis, dug out the vines and planted raspberries. But many of the dug out root clumps were so healthy and sturdy, I couldn’t just toss them in the compost pile. So I chose the best looking and planted them along the west garden fence, about 30 feet from the woods. Though less sunny, this area was more protected from frosts by the nearby forest. I didn’t expect to get fruit here, but thought they might at least produce attractive vines. I dug in one by each fence post, ten feet apart, and pretty much forgot about them. They didn’t get any special care, though I would occasionally pull or cut back the grass and weeds and cut down the wild brambles. If I had some extra mulch, I’d throw some around the vines, and the trees added their own natural mulch. They grew. And didn’t winterkill. I became more interested, tying them up and cutting off some of the growth. They grew sturdier, and I started studying books, trying to decipher the confusing rules of pruning and training the vines. I stood resolutely in front of my vines with books in hand -- but my vines seemed to bear little resemblance to the drawings. Were we talking about the same plant? I persevered. I started to truly care about those three growing vines. Did I dare hope for -- grapes -- someday? Four years later they did it. They barely made it, but mature they did -- 5# of the most beautiful grapes I’d ever seen from three valiant Valiant grape vines. Then 13#, then 14#. I made juice and jam and wine. We cut down a grove of nearby wild cherry trees that were shading the vines. I was now serious about my grapes. I harvested 28# the following year. I was learning, and they were responding. They weren’t the sweet, dessert table grapes of commerce, but they tasted just fine to me. I was soon working on developing the skill of popping several into my mouth, slipping them out of their skins and spitting out the seeds without spitting out the pulp. Homesteading is full of necessary new skills to learn. Lesson number 2 -- no rule is sacrosanct. It all depends. And your own experience is the best, and maybe only true teacher. Good sun exposure is important for grape production and these grapes would no doubt be sweeter and earlier maturing with more sun, but in my case, the trade-off of less sun for the buffering affect of the woods was a higher priority. Fewer grapes is better than no grapes. It’s a good recommendation to plant young one year old plants or rooted cuttings. But I dug and moved yet another three year old vine this past summer, a Kay Gray that wasn’t in an ideal spot, and it settled in just fine. We’ll see this spring if it made it through the winter without dieback in its new, more protected location. I hope so. Ideally these plants will stay and produce where they are now for many, many years since grapes vines can live a long time. 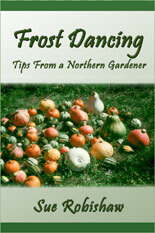 VARIETIES -- Probably the single most important thing you can do to better your chances for a good harvest is to choose a variety that suits your climate and your growing season. It’s fun to stretch the limits, but if you start with a grape that is adapted to your area, then you can enjoy its fruit while experimenting with other less sure varieties. Even wine makers consider the first, most important element in making a good wine is the choice of an appropriate grape for the area, climate, and soil. If the vine doesn’t thrive, neither will the wine. Don’t depend on the glowing verbiage of one glossy catalogue or a local nursery that just sells what is easily available, whether appropriate to the area or not. Check around, ask around, read catalogues, read books, compare notes, and be as knowledgeable as you can in your choice. If I had chosen the common and oft sold Concord instead of the shorter season Valiant, I would never have known that I could grow grapes in my challenging environment. A grape vine takes more commitment than a strawberry plant or a tomato -- you won’t know for many years whether it will mature fruit or what that fruit will taste like. But varieties, descriptions, opinions, and suggestions abound, so it’s not the chancy endeavor that it might seem. If I can find a grape to grow here, you can probably find a grape to grow where you are. There are some 6000 named varieties to choose from after all! And once you have a good, healthy, mature, producing vine, you have the source for as many new cuttings as you probably care to contemplate -- for expanding your own vineyard or sharing with others. Of course, choosing a variety will likely not be the main challenge. Once you get into grapes, limiting your planting to a reasonable number will probably be more of a problem. It’s just as well that my grape growing space is limited -- we really don’t need any more grapes, though I keep looking. It is easy and relatively inexpensive to get into grape growing, whether by buying bare rooted plants from a catalogue or dug plants from a local nursery or cuttings via mail or friends. One plant may do, but plan on a few more. Even grapes like company. TO MULCH OR NOT TO MULCH. Being an avid mulcher, I had to stop and think hard and long before mulching my grapes. It’s important to understand the requirements of the plant rather than the druthers of the gardener. Authors are across the board when it comes to care of the vine after planting, and they are probably all right -- for their climate and land. 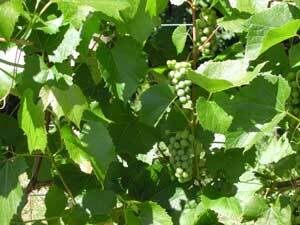 The grape wants heat to mature a good crop and mulch tends to keep the soil cool. Yet one needs to keep competing vegetation at bay, and mulch is an easy way to do this. Mulch also adds organic matter and nutrients to the soil -- too much for the hard-scrabble grape? But in areas of hard, cold winters, most vines need some protection if they are to live or produce at all, and mulch can give that protection. 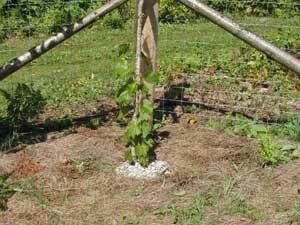 A stone or rock mulch is a possible solution, and I’ve surrounded my vines, as I do my fruit trees, with a small circle of gravel. I started placing flat rocks on the ground between vines. But during harvest when I dropped a couple of precious bunches of grapes on the stone, with a resulting messy splat, the stone mulch didn't look so good. And it wasn't easy to pull the weeds from among the stones. Hay mulch was looking better. Then I decided to expand my grape plot. The Fedco catalog had enticed me with a King of the North description. Then a Bluebell caught my eye the next year. The grape row made a 30 degree turn and headed northeast. Still within the buffering affect of the woods, the new area had fairly good sun exposure. But it also had good sod. So we mulched it heavily to clear the ground. It will need that mulch cover for many years to keep the grass at bay. I removed the flat stone from the older plot (we wanted it for building stone anyway) and mulched that area, too. For me, mulch makes sense. I decided to simply rake it off the plot in the late spring, hoe the ground as needed, then put mulch back on later. The soil will be bare to soak up the sun in the early summer, mulched to keep weeds and grass under control in late summer, and protected from the deep cold of winter when we don’t get enough snow. 2008 ~ The mulch worked fine, but it was a fair amount of work and hard to manage with such a long expanse neighboring a good grass sod. So I tried a recommendation I had read about (where??) to keep the ground bare in the early summer, then plant a "sod" for winter protection. By planting oats in August I have a nice growth to keep the ground temps moderate over winter, and keep the ground from warming up too fast in the spring. When the weather settles and warms, I hoe in the winterkilled oats and leave the ground bare to soak up the early summer warmth, with maybe a hoeing or two to keep weeds down. Then in August, I plant oats again. I like this system better, and the grapes don't seem to mind. 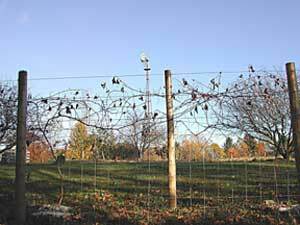 MANAGING THE VINE is probably the most challenging aspect of growing grapes. In the north, protecting the vine and the buds from frost and winter-kill is a necessary consideration. One way is to train the vine so the canes can be taken down in late fall and covered with mulch or dirt for winter protection from the cold. A lot of work. Some recommend growing two trunks in case of an unusually cold winter where there would be the better chance of at least one of the trunks surviving. I did this for awhile but realized that it was probably more important in a commercial vineyard than in the home garden, where being without a harvest for a few years while you trained up a new trunk might be inconvenient, but not a financial disaster. But while I had two trunks, I experimented by laying down the canes of one trunk and covering them for the winter while leaving the other trunk’s canes on the trellis. There was little difference between bud survival or harvest between the two, so I thankfully dispensed with this extra work. The Valiant was hardy enough in its new location to survive just fine on the trellis. And I decided any other grape I grew would have to be likewise as hardy. 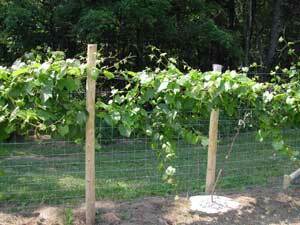 But this is certainly an option for getting a tender vine through a cold winter. There is still the problem of late spring frosts and freezes damaging the buds and new growth, even if the vine makes it through the winter. I prune my vines to the number of canes I want before the buds start to swell in the spring, but leave the canes long. After the buds swell, I prune them to final length. This way I can more easily see which, if any, buds have been winterkilled. Plus the delayed pruning delays growth and bud break of some of the buds, hopefully getting them past the dangerous late frost period. Some cold years I end up covering the vines with blankets spring, summer and fall to protect from unwelcome freezes -- an easy way to expand my chances of a good harvest. They look rather like colorful ghosts out for a dance, which helps lighten the "I can’t believe we’re getting another freeze in July" angst. And those years (thankfully few) that froze the buds in spite of all, the creative grape vines pushed out new buds from deeper within. The fruit was later, but it was fruit! Plants really DO know what they are doing, if we just let them do it. THERE ARE MANY TRAINING SYSTEMS for the grape grower to choose from once the vine starts growing; and they are explained well in most books on grape growing. There is no one best method. I started with the fan system, thinking I would want to lay the vines down for the winter, but ended up changing to a different, almost opposite system. I decided that a better approach for me would be to have permanent arms go out across the top wire with the fruiting and renewing canes hanging down from there. The first buds on the canes were more prolific than the buds farther out, and they would be better protected from the cold and frost if they were toward the top of the fence rather than down by the ground where the cold settles. Also, more buds and fruit clusters would be under cover when I threw a protecting blanket over the vines. Later I found this is called the Hudson River Umbrella System. It took some years to switch to the new system, and rather confusing at pruning time, with some canes trained up and some trained down and trying to decide who stays and who doesn’t. An interesting challenge I had made for myself. But it worked and the vines set fruit. However, it was soon quite obvious that all of the varieties I had really preferred to hang their canes UP, not nicely down as the drawings in the books showed. I could tie them down to the bottom wire, of course, and I did. Over and over and over again throughout the growing season. Grape vines LOVE to grow. So, now that the vines were nicely changed over to the new system, I decided to go with the flow (or the grow) and change once again. Now the arms are going along the bottom wire, with the canes happily growing up and over, or tied to, the upper wire. I often wonder what the vines think of all this human fussing. In any event, they continue to do what they most want to do, and do so wonderfully, in spite of me -- grow canes and fruit. Meantime, I decided to move my grapes farther inside the fence. I started training a new trunk on a stake in front of the established vine. We were due to replace our old fence with a new one, so the timing was good to get the grapes off the fence and onto their own wire trellis. Although the fence was convenient, the canes loved to wind in and out of the wires which made pruning difficult -- and it was already challenging enough. Then the deer discovered the vines, enjoying the browse as they passed by. I really didn’t mind them pruning some of the shoots that grew through the fence, but when they started nosing through the wire to nibble on ripening fruit, it was time to move. When planning the new fence, we put in extra large posts in that area to handle the additional weight of the braces for the grape trellis, making up our own design to fit the space and still make double use of the fence posts. We put up a two wire trellis, the top wire at 65", the bottom at 50". 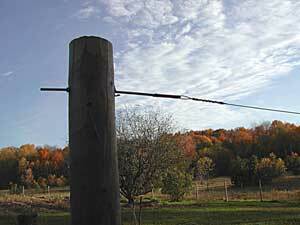 To bring the grapes in, yet still utilize the posts, Steve made 2 x 4 braced offsets to hold the wire (see photo above). One end of the long trellis wire is attached to the large gate post, the other to a homemade wire tightener made of threaded rod, nuts, and washers that goes through a separate post. In between are posts with holes drilled through, the wire running through them. A few small posts with a top notch to fit under the top wire and a side notch for the bottom wire were added later for additional bracing when the vine was in full fruit. We used the high tensile fencing wire we had purchased for the top wires of our new fence and it is naturally somewhat stretchy. Most sources recommend #9 or #10 wire for trellising. PRUNING is essential if you want a good harvest of grapes from your vines. It can be a bit traumatic, but enjoyable once you get the hang of it. The most important aspect is not to be intimidated by the confusing and complicated formulas and rules set forth in many books on grape growing -- nor by the tangle of growth and canes and shoots presented to you by your vines. 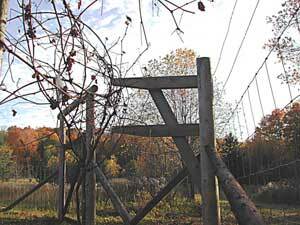 It may not be as easy as pulling runners off strawberries, but home growers have been pruning grape vines for eons. And what’s a homestead without challenges. The first year you don’t have to worry much about it, except for researching and learning so you’ll be ready when your vine is. You just want your plant to grow as well as it can and develop a good root system. Some say to choose your trunk this first year, others to leave it be until next. I let grow whatever will the first year, being happy for each new leaf. 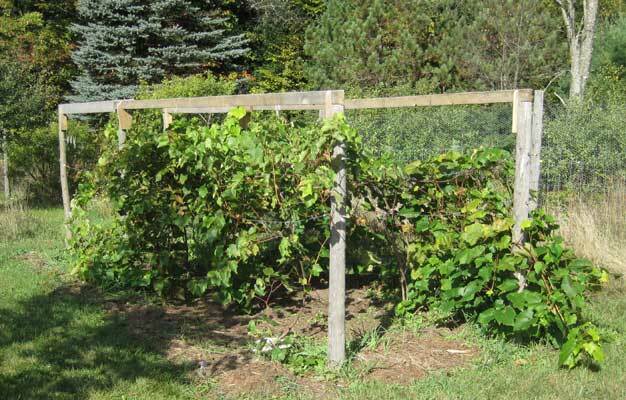 If you haven’t put up your trellis yet, you’ll want to now as the longer you wait, the harder it will be to work among the vines without damaging them. The most easily understood description and graphics I’ve seen on pruning and training the grape vine is in "From Vines to Wines" by Jeff Cox. Even if you have no interest in the wine making end of it, this is a good book for its grape growing information. "Growing Grapes in Minnesota", written by knowledgeable members of the Minnesota Grape Growers Association, also does a good job. I’m sure there are others, too, and the best is the one that is understandable to you. Glean from all the sources you can because you will pick up different ideas from each. You’ll learn most when you come face to face, or hand to hand, with your grape vine, pruning shears at the ready. It helped me to draw out the system I wanted and how the vine was to look after I had pruned it, including the number of buds to leave. I still spend a lot of time standing there trying to sort out what is what, and what isn’t. I like to take time pruning my grapes. Every vine is different, so pat formulas simply can’t apply. But if you give a reasonable amount of thought and care to your pruning, you’ll have a healthy vine and a decent harvest, all other things being cared for as well. Last year’s canes produce this year’s grapes -- rather like a biennial plant. And you need to grow canes this year for next year’s grapes. Everything else gets cut off. Then you trim back this year’s fruiting canes to a certain number of buds, maybe 30 total for the entire vine, spread over 3 to 6 canes. It’s as complicated, yet as easy, as that. You’ll learn by observing your own vines. If you have a lot of spindly growth the next year, you probably left too many buds. If the growth is rampant, too few. Or you overfertilized. It isn’t an exact science and is as open to interpretation as anything else in life. Before you know it, after all those years of growing and pruning and training, the HARVEST arrives -- for you, for friends, and probably a share for the birds, insects and animals. Some will consider this simply the midpoint on the way to a fine bottle of wine. For others, the beauty of the vines themselves are enough. I could happily spend many hours drawing or painting the grape vine. But the ripe fruit is enticing, and so beautiful. What to do with it is a whole ‘nother adventure (and article). The options are many. So while you are struggling with the pruning and wondering if those hard little balls will ever turn into soft edible grapes, think of what lies ahead. When you taste your first sun ripened picked fresh from the vine exquisitely bloomed peak-of-ripeness grape, whether sweet or sour -- when it was your own sweat that contributed to this moment -- then you will know there is hope, and all can indeed, be right with the world. Minnesota Grape Growers Association -- www.mngrapes.com. "Growing Grapes in Minnesota", 67 pages, $8.50 from MGGA, 35680 Hwy 61 Blvd, Lake City MN 55041. Lon J. Rombough, B.S., M.S., ATM -- www.bunchgrapes.com. Fedco Trees, PO Box 520, Waterville, Maine 04903-0520 -- www.fedcoseeds.com. [see "Growing Berries for Food and Fun" , published in 2016, for updates from my additional years of experience growing grapes, as well as raspberries, blueberries, and strawberries]. In the fall we put an addition onto the trellis to make room for a 50% expansion of the vinyard. Which means the addition of two more grape vines to make a total of six. In the Berry book I said 4 was enough for our needs, but it seems I was mistaken. Surely we have need for two more! Someone highly recommended Sommerset Seedless Red, and another Brianna. They both sounded good, so into the plan they went. The plants won't arrive until next spring but I prepared the additional 12 feet this year by loosening up the soil/sod with a fork, laying out cardboard to smother the vegetation, and covering all with hay. It was a decent year for the young 3 year old grape patch with a small harvest from all four vines and a long enough season to ripen even Bluebell. It was fun to get first taste of Marquette and Prairie Star -- both are winners! I'm looking forward to larger harvests in the coming years. With such a rainy summer and many frosts in September I wasn't sure we'd get ripe grapes this year. But by covering the vines with a very large tarp when the cold snaps hit to keep them from freezing they managed a respectable maturity and crop after all. Since it appears the cold/cool weather will continue, along with more rain, I harvested them today, October 1, and was happy with the yields. This is their second year of fruiting in this new spot and it appears they are much happier here with more sun, better air circulation, and slightly higher ground. I ended up with 20 pints of grape juice which is pretty good from 4 young vines. The grapes were healthy and beautiful. 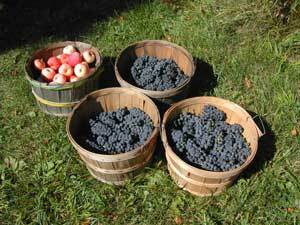 They are fun to harvest, one bunch at a time, cutting them off and laying them carefully, and admiringly, in the basket. Popping one or two in my mouth now and then. But two things were missing this year. One was the aroma of ripe grapes. It's quite distinctive and something I was used to when I harvest. But it wasn't there. Maybe because the grapes were just barely ripe, no overripe or split berries. Maybe it was the weather, cool and damp as it has been. And along with that there were no yellow jackets. Usually, I'm very conscious of their presence, carefully putting my hand on a grape cluster to make sure I don't inadvertently handle a yellow jacket along with the grapes. Now I admit it was easier that they were missing but it was disconcerting and I'd rather have them there. They love grapes as much as I do. But we've had very few wasps/hornets around this year. I missed them, and certainly hope it's a temporary situation. I have four vines fruiting and two more just planted this year. That is all I have room for in this space and that really is plenty of grapes for us. But it's hard not to keep looking for new varieties to try! I guess it helps that there are so few grapes that will mature in our climate. Bluebell - is the largest and sweetest of the current crowd, when it matures, which it barely did this year. But it is such a great grape when we do have that rare long, hot (relatively speaking) season that I keep the vine and it keeps doing it's best. It is the closest I have to an 'fresh eating' grape and I sample it regularly as soon as it colors up, waiting for it to sweeten up as well. It didn't quite make it to peak ripeness this year but it came close. And at 10# was the top producer and made decent juice. King of the North - is a grape I've grown for quite awhile, transplanting it from the old plot where it had a hard time ripening. It is very vigorous! I had to really keep on top of it with summer pruning to keep it in its allotted space. I'm sure it would prefer to have more wire to itself but this grower prefers to have more varieties so they each have to make do with less. Actually, I had planned to dig this one out after harvest. It's a small concord type, tending to get some black rot, barely ripening. It came to the new spot only because I had it and didn't have anything else to put there yet. I figured to replace it. But this year it made a good stand to prove itself, with a 7# harvest, only a touch of black rot (pruned off early), and good juice! He gets to stay, at least for now. But I do think he might be happier with someone who has more space. Marquette - is a younger vine with small purple berries, which surprised me last year (it's first small harvest) with a sweet taste as soon as it was fully colored (most grapes are several weeks or more off from peak ripeness/sweetness when they first color up). This year's harvest of 6# was good for its second year and I'm still happy with it, but the flavor was milder, likely due to the weather (last fall was unusually warm) and the bunches not as full. Again, likely due to weather during pollination. It has also proved to be a vigorous grower. My decision to plant my vines at 6 ft apart is keeping me busy with summer pruning. But it does allow me to grow more varieties in a smaller space. Prairie Star - is a petite gentle grape. A white (really more light golden hue when ripe) gem amongst its rowdy purple companions. It's grapes and bunches are small and I do hope it produces more as it ages (this is only the second year for grapes), giving me only 1#. But for the small vine it is it did well and it is a really nice mildly sweet grape, very pleasant to eat fresh, which means it loses quite a few grapes to the vineyard manager before final harvest. Two varieties were added as well -- Brianna and Somerset Red Seedless. Both grew well and it appears Brianna is another very vigorous vine. I'd be happy if it were a little less enthusiastic about growing! But hopefully it will be as enthusiastic about fruiting when the time comes. Somerset is one I'm really hoping will like it here as it has gotten very high marks for excellence from other growers in northern areas, though maybe not quite as cold as here. And it is a true seedless eating grape! The vine also appears to be of moderate vigor which sure would be nice. Can't wait for these two to have fruit, though it will be a few more years yet. Overall it was a surprisingly decent year for the grapes and vines, making it through a challenging wet season in pretty good shape. Let's hope next year is a little bit drier! We don't get ripening summers like this one very often but relish it when it happens. I sampled many berries on the vine and thankfully the birds, for the most part, were busy eating elsewhere. Unfortunately, the winter wasn't as kind, with sudden deep temperature drop in December, record cold April into sudden record high May, and little snow throughout the winter. Then there were the voles... But in spite of a lot of winter-kill on all vines and plentiful vole damage we ended up with a total of 24# harvest of well ripened berries, and lots of tasty grape juice. Both Marquette and Prairie Star had a lot of winterkill which surprised me, so harvest was light, especially with Marquette. Both grew well through the season, though, with Prairie Star finally catching up with the other vines for size. The PS fruit bunches were particularly nice and full, and delicious. I sampled this one a lot! Bluebell was a disappointment just because of the extent of winterkill, which meant a smaller harvest in a year that was finally long enough and warm enough for the fruit to mature well! But it did its best with the vines and buds that made it through the winter to put out over 8# of really nice, ripe fruit. What fruit I didn't eat fresh made great juice. It is such a nice grape that it is worth growing it even those years it doesn't quite mature. King of the North was the only vine that didn't have much winter-kill, nor any vole damage. It did have a good crop, with a harvest over 13#. But... It is a VERY vigorous vine, wanting to take over the entire grape trellis I think. Trying to keep it pruned back is an all-summer job. It doesn't mature very well, even this exceptional year, and is the least sweet of my grapes. Plus it had some black-rot this year which, since I don't spray, is something I definitely want to keep out of my small vineyard. So, though it is the most prolific of the vines, I finally decided to take it out after harvest, while appreciating the good fruit it gave me this year and previous years. In its place I planted a Prairie Star seedling I had growing in the nursery. I had planted the seed the fall of 2016 and it grew well and healthy, being about waist high. It will be fun to see how it does and what the fruit is like. As it was open-pollinated I don't know who the father is.